We have private rooms for teachers/drivers and free parking for cars/buses. We can provide dinner, lunch, packed lunch; breakfast is included. 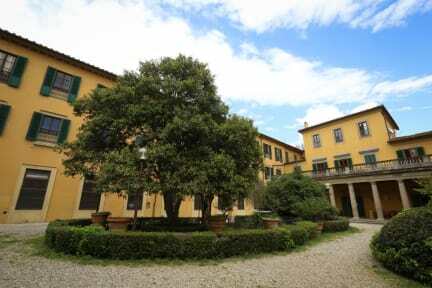 The Youth Hostel Villa Camerata in Florence, is part of the Hostelling International, association of Hostels in Italy. The rates are with the Hostelling International (www.hihostels.com) MEMBERSHIP CARD. Please note, if you are not a Member you have to pay 2 Euro extra per night (up to a maximum of 6 nights) to get your international membership card. 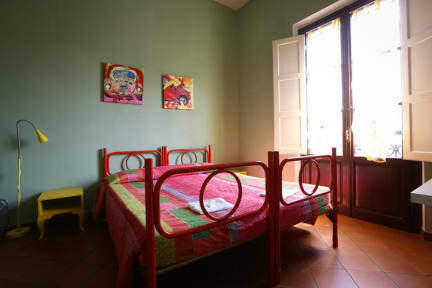 The Villa containing the hostel dates from the 15th century and is within a huge green park. But that's not all. The garden that surrounds it is a very precious botanical garden containing rare and unusual essences of vegetables, patiently cared for by the elderly owner. You will never forget a vacation spent in Firenze, a base for discovering this splendid Tuscan provincial center - a city rich with elegant architectural form, a pleasure for all to take in. The hostel offers guests a full calendar of cultural events. The Uffizi Gallery, Piazza della Signoria and the other classic Florentine places are all easily reachable by public transit. Please note, if you are not a Member of Hostelling International you have to pay 2 Euro extra per night (up to a maximum of 6 nights) to get your international membership card. It is perfect for a weekend trip. Close to the Vatican and centre and worth it's money. The owners are very friendly and will help you if you have any problems. A lot of noise and lights during the night. Waited over almost 2 hours to check in... WiFi only worked in the main room. There were only 2 outlets for a room with 8 beds.. everything is kinda far.. probably wouldn’t recommend if you’re on a budget. This was a last minute booking for my friends and I, and we chose it because it had okay reviews and it was a cheaper option. The worst thing about this hostel was the cleanliness. 9/10 times you go to the bathroom, there is NO toilet paper!!! The bathroom overall was very unclean and gross, and they also did not provide any soap in the bathroom. There was also one outlet in our room, which was a four person shared bedroom. The long dark driveway you have to walk up is scary to walk up at night. Woken up by shaking at 11 pm by a member of staff,told I HAVE to show my booking and I am in wrong room,4 man dorm which I booked!!!! !escorted to reception and told sorry we booked you into wrong room !!!!! Was given New key to room next door?????. Don’t ever go there at night! No lights on the wood! this hostel was so terrible. we walked 10 minutes through a pitch black abandoned road in a forest to get there. my bed was already slept in and not clean when i got there and when i told the staff they did nothing about it. walls were deteriorating and it got chalk all over my backpack. bathrooms were so disgusting. sketchy area, sketchy hostel.